Last Sunday at Revive, we talked about 4 different theories of the atonement – i.e. ways of looking at Jesus’ death and resurrection that help us to understand what this accomplished and how it works to achieve our salvation. On 22nd June Stephen Ibbotson is coming to speak to us about another theory that has recently started to become prominent. The atonement isn’t something that’s very easy (or perhaps even possible) to completely get our heads around, but there are many metaphors used in scripture to describe it which help us to get hold of it in terms that we can at least partly understand. I’m not sure it’s possible to overestimate the significance of what Jesus’ did on the cross, and I’m sure there are levels to it that we haven’t even begun to appreciate. In this post I’d like to make so bold as to introduce three of my own “theories of the atonement” that have occurred to me as I’ve pondered this over the years. They’re not in any way meant to provide a complete explanation of what Jesus’ did (and maybe they’re completely wrong! ), but I don’t think any of the other theories do that either. These are just my attempts – accompanied perhaps (hopefully!) by a small level of insight – to understand certain aspects of it. a) That Jesus was His Son who he loved, so it must have hurt Him like crazy to do that! b) Jesus was in fact also God, so God himself actually bore our punishment! a) What does it mean for Jesus to “take on my sin”? How is that actually possible? How can Jesus really be guilty of something that’s been done by somebody else? b) Why does God need to punish anyone anyway? If someone “sins” against me, then I can just forgive them. If they’ve done something really terrible, then that might be difficult and will involve recognising and acknowledging the enormity of their offence and then choosing not to hold it against them, but it is still possible for me to do this. Why can’t God do that as well?I think that both points, but particularly the first one, can be answered by the fact that we are – as is frequently stated in the New Testament – “in Christ”, but what does that mean? I think it means that we have submitted our lives to Jesus and He has become our Lord and Master. He has taken us on, we have become His charges and He has assumed responsibility for us. So imagine this scenario on the day of judgement:We’re all standing before the judgement seat, and God declares me innocent – without charge! Then someone at the back stands up – angrily – and says, how can you so that God? You’re supposed to be just! You have to punish him for what he did to me! Then Jesus stands up and says, “No! I’m responsible for this one. He belongs to me”. Robbed of justice against me, my accuser’s anger might – perhaps rightly – turn to my protector, but it’s no use. He’s already accepted responsibility for that and justice has already been served. Whether Jesus is rightly responsible for me in spite of my accuser’s protestations, or whether He has denied them justice and is thus deserving of their ire – either way, He has suffered for that choice, made in love – the price has been paid!In this particular model it is my accusers – rather than God Himself – who are demanding that justice be served, and in His role of judge of the Universe, God is obliged – by His own standards – to ensure that this is so. God’s righteousness is perfect and complete in every detail, such that ultimately no-one will ever have a legitimate reason to complain. Jesus’ death and resurrection makes it possible for Him to “bend His own rules” on behalf of those who put themselves in His care, since He has already paid the full penalty for doing so. In Cafe Theologique a little while back, we discussed evil and suffering and whether God could be said to be responsible for those things, or whether in fact, if there is such a thing as free will, then evil can be said instead to come from individual agents like us whose choices God doesn’t control and may not even be able to fully predict.In the Old Testament there seems to be quite a strong tradition of “blaming” God for things. In 1 Chronicles 21, we are told that Satan incited David to take a census of Israel and that God was angry about this, but when the same story is told in 2 Samuel 24 – with the same outcome – we are told that it was God who incited David to do this! Job constantly blames God for his suffering, even though we are told it was Satan who did this to him (although interestingly, it was God who permitted him to do so…). Naomi declares in Ruth 1 that, “the Almighty has made my life very bitter. I went away full, but the Lord has brought me back empty … The Lord has afflicted me; the Almighty has brought misfortune upon me”.At some level – regardless of free will – as the creator and sustainer of everything, God has to accept some kind of responsibility. He set the ball rolling, knowing (or at the very least having a very good idea) how much evil and suffering would result, and he chooses constantly – however noble his reasons – not to prevent a great deal of it from taking place.So where am I going with this? I’m certainly not suggesting that God himself is a sinner who needs to be punished – just in case you were wondering! What I am saying is that there is another aspect to the cross – not really a complete theory this time – which is that in spite of all the sin and suffering in the world, God really is a good God, who takes seriously His responsibility for what He has created! Yes, He did unleash incredible suffering – by giving autonomy to His creatures – but He didn’t, and doesn’t take this lightly. He bears, and expects to bear, the full weight of this on Himself – He doesn’t just leave it to us to get on with – because He knows that ultimately it will be worth it for all of us! Many years ago – when I was struggling with the feeling that God seemed rather aloof from His suffering creation – I bought a book by Japanese theologian Kazoh Kitamori, called, “Theology of the Pain of God”. Kitamori takes as his starting point a somewhat obscure verse in Jeremiah about the pain in God’s heart (some translations soften this to “yearning”) over his rebellious “son” Ephraim, and then goes on to unpack the intimate and inseparable relationship in the heart of God between love and pain.However intense and terrible the sufferings of Christ on the cross were, they are actually just one aspect of the suffering that God continually goes through, as He watches the people who He loves continually abusing themselves, one another and the amazing and beautiful world that He created.This model of the atonement then, is not about punishment. 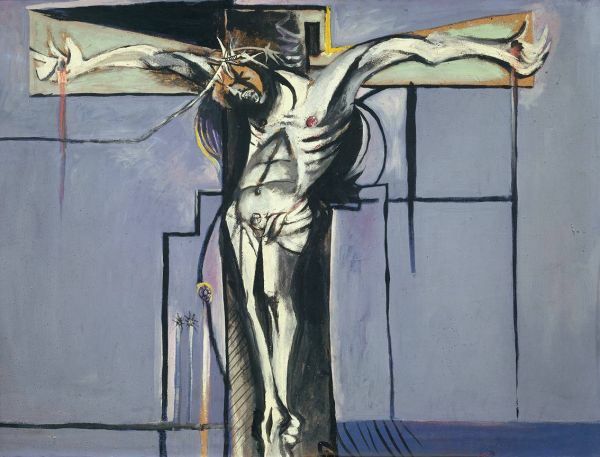 Instead it focuses on Jesus’ suffering from a different angle, which is that when Jesus suffered and died on the cross at the hands of those He loved, He incarnated the anguish and suffering of the Father, by not just emotionally but physically exposing himself to the pain of the world and to the pride, selfishness and rebellion of those who cause it. For our part, we demonstrated that we are God-killers. It was a particular group of people in a particular time and place that did this to Him, but actually, that potential is in all of us. All of us have something deep within our souls that says, “Me first, I’m number one!”, and ultimately, if carried through to its conclusion, this has to come into conflict with God. I can’t be number one if God exists and He is Lord, so ultimately, the only way past this is to kill God! Our only safe way out of this impasse is to submit to Him and be reconciled to Him in love. God offers us forgiveness and reconciliation, but it isn’t an easy way out. Because of Jesus’ death and resurrection, we can now see very clearly what we’ve done to Him – but by confronting this along with God’s grace and forgiveness, we can now also be truly reconciled.